While it may not bother some, many patients are concerned with signs of aging that they notice in their hands. This is natural, as we often use our hands to communicate, and they are constantly in our sight and that of others, with whom we interact. As we age, soft tissue atrophy is a natural phenomenon, and in the hands, volume loss often manifests significantly, giving a skeletonized, hollowed-out appearance. 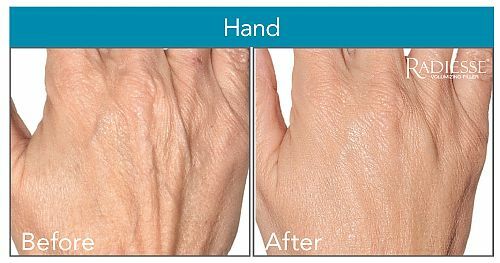 Beginning this September, we will be offering hand rejuvenation treatments in the office using Radiesse, one of our most popular injectable fillers. Radiesse is the first and only FDA-approved product for hand augmentation to correct volume loss in the hands. Radiesse restores volume to the hands while providing smooth, natural-looking results that can be seen immediately and can last up to 1 year!